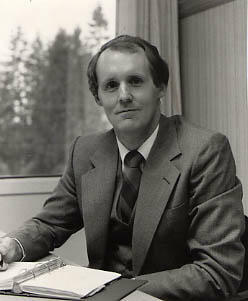 Photograph of administrator Vernon J. Storey, Executive Vice President, seated at his desk; close-up shot. 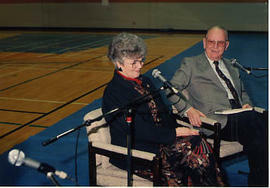 Photograph of Jim Geddes, former registrar, standing in front of the gymnasium. Photograph of Bruce Traub, R. Neil Snider, and Ken Davis performing a musical piece for a Christmas banquet, dressed as the three wise men.